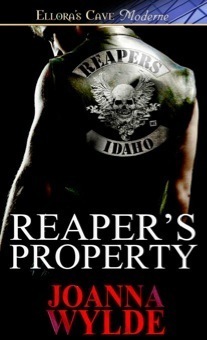 Dark, Gritty, a motorcycle club as it truly is..rough edges and all. Loved it!! A darker and grittier story. If you are looking for a read like Motorcycle Man by Kristin Ashley you will be overwhelmed Joanna Wylde takes a much more realistic view of MC's her novel is edgier showing the crude, lude bikers and a much darker story. The characters are a definite study in the behavior of the darker side of a MC which truly shows up the innocence of Marie our female protagonist. I was put off by Marie throughout most of the novel putting her in the TSTL category. I am not sure how anyone who watches TV could be as unaware of what a MC could be up to and of at least some of their traditions. I felt she was leading him on in fact I thought she was a c&cktease. Luckily she redeemed her self in the last part of the book. Horse on the other hand was a balls to the walls, straight shooter who made every attempt to show her his "softer" side. I was definitely team Horse throughout this novel. I must state that Marie's character did lose this book a star. What really made this book different was the story-line and the different vehicles used to move the plot along. I enjoyed when we got a peak into Horse's mind in a few chapters, it really took the story to a deeper level. The suspense kept me on the edge of my seat. The secondary characters kept me guessing as to who was going to turn on Marie and Horse. The tragedy of addiction is used to highlight how a person can change and how easy it is to distort facts. I found the story engrossing and could not put it down. In fact I started it at bed time and finished it as the sun started to come up. I just couldn't put it down. This was a 5 star read for me in almost every way but I did have to take off 1/2 a star because of Marie. So I am giving this Novel a 4.5 bear rating and I just can't wait until the next book comes out. Looking for a meaty, dark read but a HEA? this is definitely a book you will enjoy. I agree, I can't wait for the next one. Have you read the Marie and Horse's first meeting from Horse's POV it is on Joanna's website.